Manchester United's Paddy McNair may join up with Northern Ireland for next week's friendly with Latvia despite not being named in a 23-strong squad. McNair is still overcoming an abdominal injury sustained in the Euro 2016 qualifier with Finland on 11 October. "Hopefully he will join us - we will monitor him over the next couple of days," said NI manager Michael O'Neill. Aaron Hughes will miss the friendly in Belfast on 13 November as he attempts to regain fitness with Melbourne City. "Aaron is not back to full fitness yet and given that he would have to travel from Australia we thought it best to leave him to focus on getting himself fit," explained O'Neill. Another defender Ryan McLaughlin, 21, who is on loan from Liverpool to Aberdeen, is not included in the squad but West Bromwich Albion's Jonny Evans returns for the Windsor Park match after missing the qualifiers against Greece and Finland with a hamstring injury. There is no recall for striker Martin Paterson, who has just returned to English football with Blackpool after an injury-ruined spell in Major League Soccer with Orlando City. 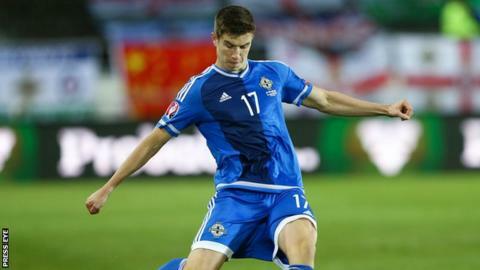 Northern Ireland qualified for next summer's Euro 2016 finals with a win over Greece in Belfast last month. Latvia finished bottom of their qualifying group for the finals while Michael O'Neill's side won Group F.
Northern Ireland qualified for a major tournament for the first time in 30 years thanks to an impressive campaign which included just one defeat in 10 games. The match against the Latvians, which was only finalised last week, will be the last before the draw for the Euros is made in Paris on 12 December. All members of the squad will be keen to impress with 23 places on offer to make up manager O'Neill's squad to travel to France next year. Northern Ireland have won four of their six meetings with Latvia, who secured a 1-0 victory in the last encounter in 2007 in Riga. Northern Ireland squad: Goalkeepers: Roy Carroll (Notts County), Michael McGovern (Hamilton Academical), Alan Mannus (St Johnstone). Defenders: Chris Baird (Derby County), Gareth McAuley (West Bromwich Albion), Jonny Evans (West Bromwich Albion), Craig Cathcart (Watford), Shane Fergsuon (Newcastle United), Lee Hodson (MK Dons), Conor McLaughlin (Fleetwood Town). Midfielders: Steven Davis (Southampton), Chris Brunt (West Bromwich Albion), Corry Evans (Blackburn Rovers), Oliver Norwood (Reading), Patrick McCourt (Luton Town), Stuart Dallas (Leeds United). Forwards: Kyle Lafferty (Norwich City), Niall McGinn (Aberdeen), Jamie Ward (Nottingham Forest), Josh Magennis (Kilmarnock), Billy McKay (Wigan Athletic, on loan at Dundee United), Will Grigg (Wigan Athletic), Liam Boyce (Ross County).